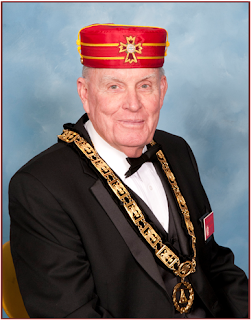 This is my last article and month as your Venerable Master and I thank the Brethren for allowing me to serve in this important leadership position. It is my hope that you believe I served you well. In my articles I strived to present a bit of Masonic Light for your consideration. This month I want to follow up on the subject of Alchemy and its’ relation to Freemasonry. At our December Scottish Rite Night of Instruction, Brother Gregory Peters, our guest speaker, related interesting information concerning the Alchemical symbolism of our double-headed eagle. With that in mind, I offer the following. Brothers Russell Donathan and Roger Davis in their paper published by the High Council of Societas Rosicruciana in Civitatibus Foederatis in 2009 had this in part to say about Masonry and Alchemy. “The ancient art of Alchemy almost certainly had an influence on the development of Freemasonry. Both are disciplines seeking how the Divine potential within the human being is unveiled and manifested. Both represent paths to the greater mysteries which lead to enlightenment. Both are focused on the process by which knowledge or illumination (gold) conquers ignorance (lead) within the human psyche. Alchemy holds that the physical body is product of consciousness and the mind is the creator and sustainer of form. Indeed one of the main ideas of Hermetic philosophy is “the All is Mind; the Universe is mental.” This suggests that all creation is a result of the Mind of God. And since Man is made in the image of God (the root word for “man” is “mano” = mind), this means the Mind of God is within Man. The implication of this unworldly connection is that the mind can become a force whenever the energy of right thought and action becomes the focused will of humanity. Consciousness begets will, which becomes the bellows for global consciousness. The goal of alchemy is transformation. To the alchemist, to change lead into gold means to change the slumber of consciousness into awareness. It is the change that is the key of Alchemy. “ We must be aware that although change is possible from a global or universal perspective, as well as within our own mind and character, such change can represent change for the better or for the worse. I recommend to you the teachings of the Kabbalah, Noetic Science, String Theory and Alchemy. The four are interrelated and can combine to activate Man’s Potential . The secret one might learn in these circles of ancient knowledge is not in how to die but in how we choose to live.